A few easy swaps and you’ll get a dip that’s full of flavor, but healthy enough to be a one-dish meal. Warm up refried beans in a small pot over medium heat. Add in taco seasoning to taste. Once all combined, set aside to cool. Peel, pit, mash avocados in a small bowl – add lemon juice, salt, pepper, and stir to combine. Combine yogurt and taco seasoning mix in another bowl. Cut corn tortillas into eighths and spread on a baking sheet that has been sprayed with olive oil cooking spray. Spray the tops of the tortillas with cooking spray, season with salt, and broil at 350° on low until the tortillas are crispy and golden brown. To assemble:Spread refried beans on a large, shallow serving platter. Spread yogurt mixture over bean dip. Sprinkle with green onions and tomatoes. 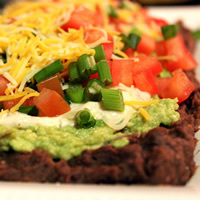 Cover with grated low-fat Mexican cheese. Serve with homemade corn chips!